Nose hair can be a tricky problem sometimes. Usually, the issue of hair sticking out from the nose is common as you age, but for some it may start early as well. The only solution is to remove them or keep them trimmed. Removing using tweezers can be a painful experience and cutting with scissors can lead to cuts inside the sensitive areas of our nose. Although today there are many modern hair removal gadgets like epilators, shavers or even home laser devices, none of them can be used to trim nose or ear hair. The only modern gadget that can takes care of that is a nose hair trimmer. While looking for a best nose hair trimmer you have to consider few factors. As most of the nose hair trimmers are battery powered, the one which gives maximum operation time will be more suitable during travel. Other factors to lookout are a painless cutting technology, vacuum suction, additional attachment heads or combs and water resistance. Low maintenance and price are also factors to consider in finding a good nose hair trimmer. Nowadays you can get them as part of a multi grooming kits also, but to get good results you can go for the nose hair trimmer alone. We review the 5 best nose trimmers that are worth the money and helps you to keep your nostrils hair free! Panasonic is one of the reliable brands in grooming world and the Panasonic ER-GN30-K is one of the best selling nose hair trimmer. The trimmer is quick and easy to use on nose hair, facial hair, ear hair, eyebrows and beard. It uses a rotary cutting system with dual edge hypo-allergenic curved blades that can trim from the top and sides for an efficient and pain free trimming. The trimmer is waterproof and has a vortex cleaning system that draws in water and spins through the trimmer to get rid of any sticky hairs. You need to immerse in water and activate the cleaning mode to clean your trimmer. It can give 90 minutes of operation by a single AA battery. It comes with a trimmer protection cap and a cleaning brush for easy maintenance. Check below video to see it action. + Weight - 2.2 oz. This is one of the best rated nose hair trimmer made of high quality steel casing which sets it apart from the competition. It also has a unique LED light that can help you get an accurate trim inside the nose. The trimmer has a rotary cutting system with steel blades and the can cut the hairs that enter the trimmer head from the top and from the sides. This enables to use them on your ears, eyebrows and beard. Also it does the trimming without any pulling and tugging.The trimmer is also wet and dry compatible ,so that you can use in shower. It operates on a single AA battery. One of the biggest selling point is that it comes with a lifetime replacement warranty which makes it even harder to beat! + Weight - 3.5 oz. Verdict : Effective trimmer with a lifetime replacement warranty that is hard to beat! Philips Norelco 5100 (NT5175/49) is a great all-in-one trimmer that not only trim your nose hair, ear hair and eyebrows but also let you style your neck, sideburns and beard. The Norelco 5100 uses advanced Pro-tec Tube technology in which the dual blades are protected with ultra-thin foil skin guard with rounded tips to prevent skin irritations. Also the trimmer ensures there is no pulling by preventing hair from getting caught between the two blades. A dual cut technology gives you a faster trim with maximum comfort. The angled head design makes it easier to reach inside your nose and remove hair from ear or trim your eyebrows. The trimmer is fully washable and blades does not need any oil for maintenance. A textured soft rubber grip gives good control while trimming. It is powered by a single lithium AA battery which gives around 100 minutes of operation. There are 2 eyebrow combs of 3 mm and 5mm that can be used on the nose trimmer head. The detailer head is a flat precision trimmer with a 3 mm comb that you can easily trim neck, sideburns and for t﻿﻿rimmi﻿﻿ng your﻿﻿ bea﻿﻿rd. The kit also include a protection cap, travel pouch and cleaning brush. Overall a great multi-purpose ear and nose trimmer. + Weight - 4.8 oz. This is another best ear and nose hair trimmer from Panasonic that features a micro vacuum system to clean up hair as you trim. The vacuum whisks away all the hair as you trim for mess free trimming session. This has a rotary blade system which has curved hypo-allergenic steel blades housed inside a safety cone to protect against any cuts. The dual-edged blade can cut the hair from sides in addition to hair entering the top of the trimmer. This is done without pulling any hair for a painless trimming. Also the trimmer is full immersible in water for easy cleaning and maintenance. 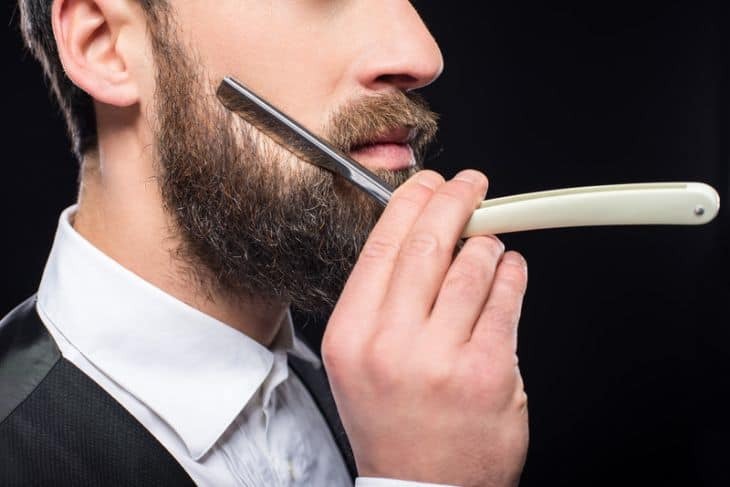 The trimmer is highly versatile and can be used for facial hair, ear hair, eyebrows and even for trimming sideburns and beard. It is powered by a single AA battery. 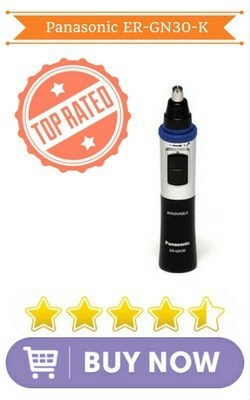 The unique vacuum system ​makes it one of the top rated nose trimmers available today. + Weight - 3.8 oz. The Groom Mate is one of the smallest and cutest nose hair trimmers today. What sets it apart from the rest is that no power is required to operate, and you can trim hair just by softly twisting the bottom part of the trimmer back and forth. Groom Mate is made purely of high quality stainless steel and guaranteed never to rust. Groom Mate has a patented manual rotary blade system that does not touch or pull your skin while trimming. It can be cleaned with water or with a brush to clean the inner shaft that can be removed by unscrewing the set screw. The solid trimmer can only be used for nose hair and not on eyebrows or ears. It comes with a lifetime warranty and you can easily carry it around without worrying about running out of batteries. + Weight - 3 oz. We hope you can now pick the right trimmer from our list of best ear and nose hair trimmers. They are inexpensive and highly portable cute gadgets that does the job well. The Panasonic ER-GN30-K is our top choice in this list for its excellent performance and easy maintenance.